← What Goes Well With Watches?….. The last page I uploaded featured Brian’s superb work on the ‘Speedy’ 67-9313 chronograph, and I’m pleased to say that his work will appear once again. But this time it’s not a chronograph…. The watch I’ll be looking at in the article has been with Brian for repair and full service, but is now finished and will soon be on its way back to me. Once here I’ll be able to complete and upload the article. 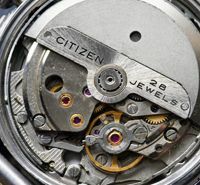 I won’t say which model it is just now; it is of course a vintage piece and a rare bird too – it was a first for Citizen and has needed a good deal of research and work by both Brian and myself to really understand its history. The article will reveal a fascinating back story to the model – and one or two surprises! So please watch this space, and I’ll keep you posted on progress and let you know when the page is published. 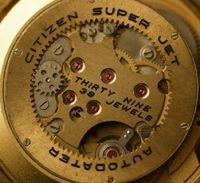 This entry was posted in Vintage Watches. Bookmark the permalink. Sounds great, can’t wait to see the watch and read the article! Hi Bram, good to hear from you 🙂 It will probably be a couple of weeks at least before I can publish, depends on shipping time etc. (there’s a big pond between Brian and me). 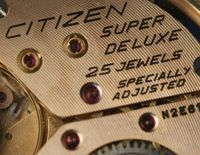 The watch has been with Brian since February – but parts were needed, and vintage Citizen parts can be very difficult to find at the best of times. This is a model I’ve only seen for sale about three or four times, and never outside of Japan. But we managed to do it! And it was finding the parts that uncovered the wider story…. Indeed, shipping times over the ocean always take quite long, but when I see the work Brian does I think it’s well worth it. Really loved his Speedy restoration too btw. 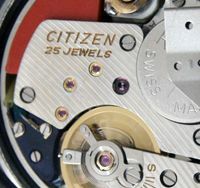 I recently bought a Citizen single register chronograph – a 67-9577 with a polished metal case (should have been black, but obviously had been ‘refurbished’. As wouldn’t run overnight (when I wasn’t wearing it), I decided to have it serviced. It’s now come back and runs overnight, but gains 5 mins/24 hours. My local watch repairer, who sent it off to a specialist, didn’t charge me, as he, in turn wasn’t charged. Could I presume to ask you if you could point me in the direction of any specialist who could rectify the fault? I did try to buy a NOS 8100a movement off WUS, but the seller told me it had been sold, and I don’t know what part(s) would be required. Obviously, a UK based specialist would be convenient, but I’m willing to send the watch off elsewhere. I really like the watch, and I’m reluctant to sell it off for spares, unless it really isn’t fixable. Hi Geoff, thanks for visiting my blog. 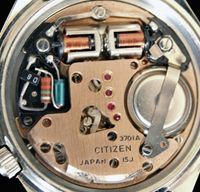 Mechanical chronographs, like the 8100 movement in your example, do need to be worked on by people who have experience with them. I can recommend someone, so I’ll send you an email.